Davao del Norte (Cebuano: Amihanang Dabaw) is a province in the Philippines located in the Davao Region in Mindanao. Its capital is Tagum City. Davao del Norte also includes Samal Island to the south in the Davao Gulf. Before 1967, the five provinces—Davao del Norte, Davao Oriental, Davao del Sur, Davao Occidental and Compostela Valley—were administered as a single province named Davao. The Davao Region is coterminous with this former province. Davao del Norte is also known as "the banana capital of the Philippines." Davao del Norte and Compostela Valley, together with Davao Oriental, Davao Occidental and Davao del Sur used to be a whole province simply known as Davao. This original province was split into three: Davao del Norte, Davao Oriental, and Davao del Sur when Republic Act No. 4867 (authored by Representative Lorenzo S. Sarmiento, Sr.) was signed into law on May 8, 1967 by President Ferdinand Marcos. 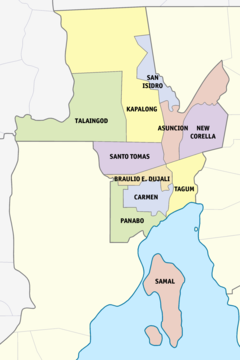 Davao del Norte originally comprised thirteen municipalities: Asuncion, Babak (now in Samal City), Compostela, Kapalong, Mabini, Mawab, Monkayo, Nabunturan, Panabo, Pantukan, Samal, Santo Tomas and Tagum. On May 6, 1970, six more municipalities were created: Carmen, Kaputian (now in Samal City), Maco, Montevista, New Bataan, and New Corella. The passage of Republic Act No. 6430 on June 17, 1972 changed the name of the province from Davao del Norte to Davao. By 1996, Davao had a total of twenty-two municipalities with the creation of San Vicente (now Laak) in 1979, Maragusan in 1988, and Talaingod in 1991. On January 31, 1998, President Fidel V. Ramos signed Republic Act No. 8470, which split the province into two, creating the province of Compostela Valley. In the meantime, Davao was renamed back to Davao del Norte. Together with the creation of the new province, two cities and one municipality were created: the municipality of Tagum, capital of Davao del Norte, was converted into a city (R.A. 8472); Samal, Babak, and Kaputian were joined into the city of Samal (R.A. 8471); and the municipality of Braulio E. Dujali was created out of several barangays in Panabo and Carmen (R.A. 8473). The province then had 8 municipalities and 2 cities. Republic Act No. 9015, signed into law on March 5, 2001 by President Gloria Macapagal-Arroyo, converted the municipality of Panabo into a city. Republic Act No. 9265, approved on March 15, 2004 created the municipality of San Isidro from Asuncion and Kapalong. Davao del Norte covers a total area of 3,426.97 square kilometres (1,323.16 sq mi) occupying the north-central section of the Davao Region. The province borders Agusan del Sur to the north, Bukidnon to the west, Compostela Valley to the east, and Davao City to the south. Samal City is the only municipality or city in the province not situated on Mindanao island. The city covers the entire Samal and Talikud Islands within the Davao Gulf. The Leonard Kniaseff volcano is located within the province. Davao del Norte comprises 8 municipalities and 3 cities. ^ Coordinates are sortable by latitude. (Italicized coordinates mark the generic location. Otherwise, they indicate the city/town center). Davao del Norte had a population of 1,016,332 in the 2015 census. The population density was 296.57297/km2 (768.11768/sq mi). Main languages spoken are Cebuano and Davawenyo. English and Filipino are also widely spoken. Talaingod is the home of many indigenous groups in Davao del Norte. Most of them are Lumads and Aetas. Davao del Norte is a primarily agricultural, but also engages in mining, forestry, and commercial fishing. The principal crops of the province include rice, maize, banana, coconut, abacá, ramie, coffee, and a variety of fruit and root crops. Davao del Norte is the country's leading producer of bananas, with many plantations run by multinationals Dole and Del Monte, and local producers such as Lapanday, TADECO, and Marsman. Davao del Norte is also one of Mindanao's leading producer of rice. Davao Gulf, to the south of the province, provides a living for many fishermen. Some of the fish products include brackish water milkfish, tilapia, shrimp, and crab; and freshwater catfish and tilapia. Davao del Norte is a major producer of gold, and its mining resources include silica, silver, copper and elemental sulfur. Small-scale gold mining activities thrive in several areas. There are also numerous active quarries of commercial quantities of gravel, sand, and pebbles for construction. Tourism is also a major part of the economy of Davao del Norte. There are a lot of beaches on Samal Island, the most famous of which is Pearl Farm Beach Resort. Banana Beach Resort is the most famous beach outside of Samal Island. Commerce is also a major part of the economy of Davao del Norte. There are lot of shopping malls in Tagum City. ^ "List of Provinces". PSGC Interactive. Makati City, Philippines: National Statistical Coordination Board. Archived from the original on 21 January 2013. Retrieved 24 April 2014. ^ a b c d Census of Population (2015). "Region XI (Davao Region)". Total Population by Province, City, Municipality and Barangay. PSA. Retrieved 20 June 2016. ^ "Republic Act No. 4867 - An Act Creating the Provinces of Davao del Norte, Davao del Sur and Davao Oriental". Republic Acts. Chan Robles Virtual Law Library. Retrieved 25 April 2014. ^ "Republic Act No. 6430 - An Act Changing the Name of the Province of Davao del Norte to Province of Davao". Republic Acts. Chan Robles Virtual Law Library. Retrieved 25 April 2014. ^ "Batas Pambansa Blg. 23; An Act Creating the Municipality of San Vicente in the Province of Davao del Norte". The Corpus Juris. 4 April 1979. Retrieved 19 March 2016. ^ "Presidential Decree No. 1247; Creating the Municipality of San Mariano in the Province of Davao". Chan Robles Virtual Law Library. Malacañang, Manila, Philippines. 25 November 1977. Retrieved 19 March 2016. ^ "Republic Act No. 6678; An Act Changing the Name of the Municipality of San Mariano in the First District of the Province of Davao del Norte to Municipality of Maragusan". Official Gazette of the Republic of the Philippines. Congress of the Philippines. 12 October 1988. Retrieved 19 March 2016. ^ "Republic Act No. 7081; An Act Creating the Municipality of Talaingod in the Province of Davao". Chan Robles Virtual Law Library. 29 July 1991. Retrieved 28 January 2016. ^ "Republic Act No. 8470 - An Act Creating the Province of Compostela Valley from the Province of Davao del Norte, and for Other Purposes". Republic Acts. Chan Robles Virtual Law Library. Retrieved 25 April 2014. ^ "Republic Act No. 8472 - An Act Converting the Municipality of Tagum, Davao Province, Into a Component City to be Known as the City of Tagum". Chan Robles Virtual Law Library. Retrieved 16 December 2015. ^ "Republic Act No. 8471 - An Act Constituting the Three Municipalities of Babak, Samal and Kaputian of Samal Island, Province of Davao, Into a Component City to be Known as the Island Garden City of Samal". Chan Robles Virtual Law Library. Retrieved 16 December 2015. ^ "Republic Act No. 8473 - An Act Creating the Municipality of Braulio E. Dujali in the Province of Davao, and for Other Purposes". Chan Robles Virtual Law Library. Retrieved 16 December 2015. ^ "Republic Act No. 9015; An Act Converting the Municipality of Panabo, Province of Davao del Norte Into a Component City to be Known as the City of Panabo". Chan Robles Virtual Law Library. Retrieved 16 December 2015. ^ "Republic Act No. 9265; An Act Creating the Municipality of San Isidro in the Province of Davao del Norte". The LawPhil Project. Retrieved 16 December 2015. ^ a b c "Province: Davao del Norte". PSGC Interactive. Quezon City, Philippines: Philippine Statistics Authority. Retrieved 8 January 2016. ^ a b c Census of Population and Housing (2010). "Region XI (Davao Region)". Total Population by Province, City, Municipality and Barangay. NSO. Retrieved 29 June 2016. ^ "Philippines Census Of Population of all LGUs 1903-2007". archive.org. Philippine Statistics Authority. Retrieved 11 March 2017.